Robert Knapp earned his Ph.D. in mathematics from Princeton University in 1972. He has published work on differential geometry and partial differential equations, and, after a year at the Insitute for Advanced Studies in Princeton, taught graduate and undergraduate mathematics at Purdue University. His study and appreciation of abstract mathematics began in high school and his conviction that mathematics, including abstract mathematics, is about the world began then, as well. Although he retired from the profession in the late 1970s, his study of the content, history and application of mathematics continues to this day. 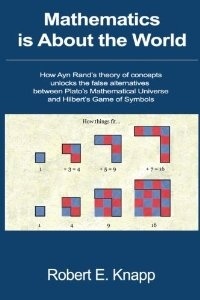 In recent years he has presented his unique perspectives on geometry and the number system in a series of lectures at Objectivist Summer Conferences organized by the Ayn Rand Institute. He has lived in the Philadelphia area for almost 30 years. Are you interested in errata? I’m just starting Chapter 5 and have found four so far. BTW, very interesting and thoroughly enlightening. I’m looking forward to diving into the rest. On a general note, throughout the text are figures wherein colors are mentioned (see Pgs 363, 364, 431, etc. ); however, none of these figures have any color. Green and red are missing. Finally, on Pg 465, the color pink pops up for the first and only time. I suspect, that should read red, instead. Finished the book, but will need additional readings to absorb all of it. Great to hear from you! A friend saw a review of your book a few months ago and brought it to my attention. I bought your book in September but have not yet read it. I would certainly be interested in corresponding. The best review of my book is the one by Andrew Layman on Amazon. An author who envisaged for certain respects your ideas about Euclid geometry is Hugo Dingler;a german philosopher and mathematician who published two books about this topic;though a neglected figure in the realm of mainstrem philosophy it has also today some followers in Germany.The books are,alas,in german and the most pertinent to your enterprise is:Die Grundlagen der Geometrie.If you do not find a copy in some USA library I may send you,if interested,my personal pdf copy (which can be used for personal study only). Thank you for the information! I have ordered a reprint on Amazon with a similar name, but it has the word Angewandten before Geometrie. Does this sound like the same book? If not, I would be interested in the PDF. On page 261, the paragraph beginning, “To express this symbolically”, the word “form” should be “from”.